I'm a 'closet' poet. There...now the world knows! I write mediocre poetry that is often inspired by the Divine. Perhaps because I'm so bad at it, I really appreciate others who write the good stuff. Early in December at an Anglican worship meeting, I became intrigued by sonnets we read based on the "O" antiphons of Advent. Through some sleuthing on the Internet (one of my favorite pastimes), I discovered the sonnets were written by Malcolm Guite. 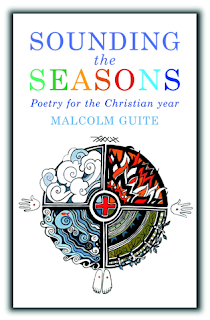 And when I visited his website, I was delighted to find that Malcolm Guite is actually Revd. Malcolm Guite, Anglican priest, chaplain and teacher at the University of Cambridge. He is also a poet, musician and singer-songwriter whose wild hair and beard make me think he's channeling his inner John the Baptizer! Add to that...he is a member of an R&B band that plays gigs in the Cambridge area. My kind of guy! I ordered his book that you see here. It's full of his sonnets that give deeper meaning to the seasons of the church year. The best part about finding Revd. Guite's website, though, is his blog and audio page. For me, poetry is best appreciated when it's heard. Read aloud, it takes on meaning and nuances that go missing when you just read it to yourself. Not all poets read their poetry to my liking, however. Have you ever heard any old tapes of Robert Frost or Carl Sandburg reading? Their voices are so heavy and lugubrious; I like poetry read with some zip, some feeling. Hearing Revd. Guite read his sonnets is a soothing, meditative experience. If you're more into serious theology, he also has audio of lessons he's taught and sermons delivered with many links to other theological and spiritual sources. I highly recommend that you give him a try. I couldn't write poetry if you stood over me with an instrument of torture. So I always admire people who have this gift. You have such a gift of words Vanessa. I would bet you could come up with something under pressure!